Dr Shezad Malik Law Firm, represents people in Dallas, Denton, Collin, and Tarrant Counties and across Texas for catastrophic dog bite injury, mauling and dog attack cases. Some dogs are specifically bred to be attack dogs and have aggressive personalities and they are not meant to be home pets. An averaged sized man or woman can be seriously out gunned by such a vicious dog. And once the dog has brought the person down, fatalities can easily occur. Any dog can be dangerous, even apparently-tame dogs will defend themselves if provoked. But there are certain dog breeds that are more dangerous than others. The United States Center for Disease Control and Prevention ("CDC") has important data about dog attack fatalities occurring in the United States over an eighteen-year period. According to the CDC's data certain breeds are more dangerous than another, and it can indicate that attacks by some breeds are more ferocious than others. Based on the number of deaths by breed, the following are the most dangerous dog breeds in the United States. The most dangerous breed in the U.S. - is the "pit bull." The term "pit bull" actually applies to a family of breeds. It seems that most dog bites covered by the media involve pit bulls. Over the eighteen-year period covered by the CDC, pit bull attacks resulted in 60 fatalities. This was twice the number of the next closest breed - Rottweiler. Rottweilers were originally used as herding dogs. Rottweilers caused nearly half the number of deaths as pit bulls during the CDC's reporting period. The third most dangerous dog in America, according to CDC fatality data, is the German Shepherd. German Shepherds were developed as herding dogs. German Shepherd attacks resulted in nineteen deaths in the United States during the CDC's eighteen-year reporting period. Husky is a group of dog breeds which are used as sled dogs. Huskies fur has allowed them to adapt to life in the more temperate regions in the U.S., because it protects them not only from cold but also from heat. Husky attacks ended with fourteen deaths during the data period. Alaskan malamutes were originally used as sled dogs in Alaska. Alaskan Malamute attacks resulted in twelve deaths during the CDC's reporting period. Children are five times as likely to be bitten by a Doberman than they are to be bitten by a Labrador Retriever. The CDC reports that Doberman attacks ended with the death of eight people during the reporting period. Chow chow breed was developed in Mongolia thousands of years ago and was then introduced into China. Some homeowner's policies exclude claims for Chow attacks. Chows were responsible for the same number of deaths as Dobermans during the CDC reporting period. Great Danes are also known as German Mastiffs. Adult males usually weigh in excess of a hundred pounds. Great Dane attacks resulted in six deaths during the reporting period. St. Bernards are very large dogs with large heads. Adults weigh between 140 and 260 pounds. St Bernards were responsible for four deaths during the CDC data period. The tenth most dangerous dog in America, according to the CDC data, is the Akita. Akitas have bear-like heads, and adults males can weigh over 100 pounds. Akitas were responsible for the same number of deaths during the reporting period as were St. Bernards. Texas law holds a person responsible for the personal injuries sustained by the negligence of the dog owners for a dog bite or dog attack. 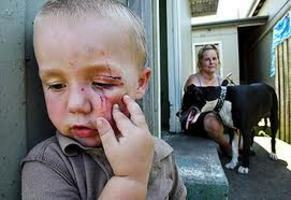 There is no excuse for a dog bite injury if a person or young child is attacked by a dangerous breed of dogs, or one known to be vicious. We aggressively pursue financial compensation for dog bite and dog attack victims who have suffered from animal attacks involving dangerous dogs or known vicious dog breeds such as Rottweilers, German shepherds, and Pit bulls etc. We hold accountable and aggressively prosecute dog owners, business owners, dog spas, property owners and people who have a duty to protect adults and children from vicious dogs in neighborhoods and especially in public parks. Often, folks are hesitate to make personal injury claims after suffering dog bites or dog attacks because they do not want to sue a neighbor or family member who owned the dangerous dog. Remember that homeowners' insurance or business insurance may be available to compensate the injured victim. Contact the law offices of Dr Shezad Malik Law Firm at 888-210-9693 ext 2. to schedule a free initial consultation after a dog bite injury or dog attack. The Texas Dangerous Dog Act is a law that applies to anyone who owns, possesses, or controls a dangerous dog. The Act is in Chapter 822 of the Texas Health and Safety Code. The Act defines a "dangerous dog" as one that either (1) makes an unprovoked attack on a person that causes bodily injury or (2) commits unprovoked attacks that cause a person to reasonably believe that the dog will attack and cause bodily injury. The law imposes certain obligations on an owner, including obtaining insurance or delivering an animal to animal control after a determination that a dog is dangerous. The Act also provides criminal penalties for dangerous dog owners. If you have additional questions or concerns regarding Texas laws on Dog Bites or Dog Attacks, contact Dr Shezad Malik toll free 888-210-9693 ext 2 or click here and fill out our contact form for a free consultation.